It’s been a while since Formula One regulations have led to a field of cars so uniformly ugly. Save for one: the McLaren MP4-27. If there’s any truth in beauty left in the world, it should win the championship on looks alone. A year ago, I wrote a post about Mercedes’s 2011 car titled “Why Mercedes will win F1 in 2011”. It’s rather fortunate I’m not in the predictions business. Far from winning F1, the Mercedes MGP W02’s best result was a spirited fourth place by Michael Schumacher at the epic Canadian Grand Prix. The car otherwise existed in an uncanny chasm between the frontrunners and the midfield, a far cry from its grandfather, the world championship-winning Brawn BGP 001. One could argue that I shouldn’t be writing posts about any possible correlation between a Formula One car’s looks and its future performance. In that spirit, this is not a prediction but a wish, necessitated by the rule change which has led to the ugly stepped noses you can see on every car which will compete this year—save for the McLaren. A wish that beauty should win, that Keats was correct when he wrote Ode on a Grecian Urn, that McLaren’s sleek and gorgeous and brutal MP4-27 will win the team’s first constuctors’ title since 1998. What&apos;s With The Weird New Noses On Formula One Cars? You know you’re in trouble when even Adrian Newey, designer of the delicate, elegant, unstoppable Red Bulls is throwing up his hands. “We’ve […] had to drop the nose just in front of the front bulkhead, which, in common with many other teams, has led us to I think I’d probably say a slightly ugly looking nose. We’ve tried to style it as best we can, but it’s not a feature you would choose to put in were it not for the regulation,” Newey said about the RB8, his latest car for Red Bull. Make no mistake: Red Bull has a very good chance to win again. While blown diffusors, the engineering solution Newey brought back to F1, are now illegal, they’ve had months to design a new car; paired with Sebastian Vettel, the RB8 will probably be a winner. But maybe not! And if not, it should be McLaren’s British duo fighting for the title. McLaren’s design philosophy over the past few years of keeping a low center of gravity at the expense of the clear airflow produced by a raised front suspension has allowed them to design a car which conforms to 2012 regulations without a nose job only a mother wearing a blindfold could love. It’s the only pretty car in the field. It should win. 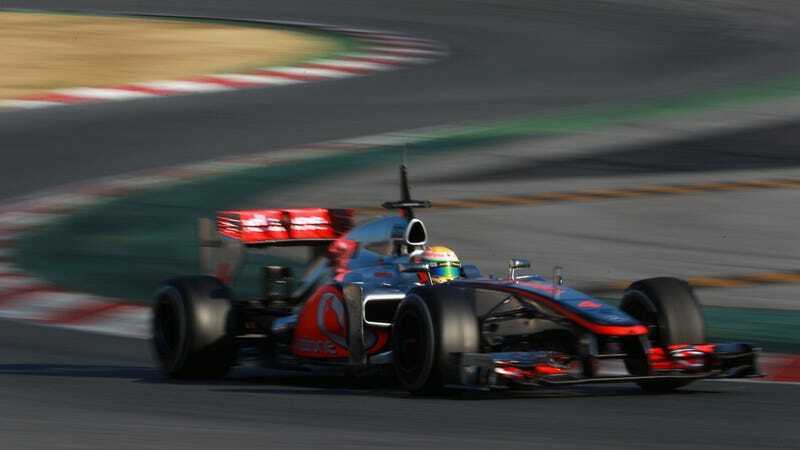 Photo of Lewis Hamilton testing the McLaren MP4-27 by Mark Thompson/Getty Images.